If you live in a home with a walk out basement, chances are part of the foundation is exposed. In most cases, the rear of the basement will be completely visible, and the sides will be partially exposed. Foundation walls are often constructed of concrete or masonry block, which is often not the most attractive of products, even when painted. Adding a stucco application to your exterior foundation walls is an inexpensive way to make your home more attractive, and may even increase its value. Stucco is a concrete product, and is made by mixing masonry sand with Portland cement and masonry cement. If you are going to be applying stucco to a large area, you may find that renting a power mixer is a good investment. The ideal time of year to work with stucco is late spring or early fall, when temperatures should not be below freezing at night, and it may not be not extremely hot during the day. Pick a week where there is no rain in the forecast. One of the secrets of how to apply stucco is to purchase your materials all at the same time, or if that is not possible, from the same supplier. Changing sand suppliers, or cement manufacturers, in the middle of a stucco application can change the color of the finished product. When applying finish coat, use your trowel to create whatever style you desire. When applying the finish coat, step back a few feet from time to time, to ensure that you are getting uniform coverage and that whatever design you are doing is blending together. 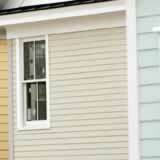 That is the basics on how to stucco, leave the stucco natural, or you may want to paint it to match your siding.